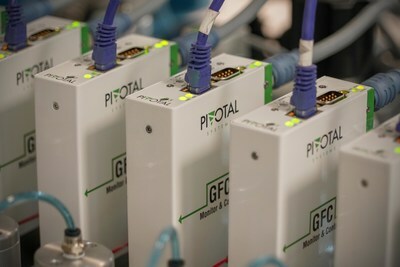 FREMONT, Calif., July 2, 2018 /PRNewswire/ -- Pivotal Systems Corporation (Pivotal), provider of the best-in-class gas flow monitoring and control technology platform for the global semiconductor industry, today made its debut as a public company, listing on the Australian Securities Exchange (ASX), following a heavily oversubscribed $53.5M (AUS) / $40.2M (US) initial public offering (IPO). Moelis Australia and Shaw and Partners were joint lead managers of the listing. Over 40 institutions participated in the IPO, including a strategic customer. The IPO demonstrates a continued strong appetite to invest in innovative, production proven, technology solutions. The capital raised by the IPO will be used to expand operations in Korea, Japan, Taiwan, China and the United States. Pivotal's gas flow monitoring and control solutions are unrivalled in their speed, precision, and sensing abilities. Many of the world's most advanced semiconductor production facilities rely on Pivotal's gas flow control solutions every day. The company has its own production capabilities in the US and contracted facilities China and Korea, and sales offices throughout the Asia Pacific region, Japan, and Europe. Pivotal Systems Corporation will be trading under the code "PVS" and has an indicative market capitalization of $233.2M (AUS) / $174.9 (US). Pivotal Systems CEO John Hoffman said, "We have seen a fantastic level of investor support, which reflects our plans to expand our capabilities and provide increasingly valuable technology to our global customers. By utilizing cutting-edge proprietary hardware and the most advanced software in our industry, we provide real value when it comes to overcoming many of the flow control challenges advanced semiconductor manufacturers face." Pivotal plans to accelerate expansion into local operations in Asia, particularly at the newest semiconductor facilities under development in Asia-Pacific, as well as expand operations in the United States. The company also intends to enter into other large industrial markets where its intelligent sensing and control technologies offer advantages. The company's machine learning platform enables a new generation of intelligent industrial controls that can drive productivity in many applications. Pivotal Systems provides the best-in-class gas flow monitoring and control technology platform for the global semiconductor industry. The company's proprietary hardware and software utilizes advanced machine learning to enable preventative diagnostic capability resulting in an order of magnitude increase in fab productivity and capital efficiency for existing and future technology nodes. This press release does not constitute an offer to sell, or the solicitation of an offer to buy, nor shall there be any sale of any securities referred to herein in any state or other jurisdiction in which such offer, solicitation or sale would be unlawful. Any securities referred to herein have not been registered under the US Securities Act of 1933, as amended (the "US Securities Act") and may not be offered or sold in the United States or to US persons absent registration or an applicable exemption from registration under the US Securities Act and applicable state securities laws. In addition, any hedging transactions involving the securities referred to herein may not be conducted unless in compliance with the US Securities Act.